Tape Attaching Left Compensating Feet for Zigzag (Adustable)For tape/elastic attaching, max. 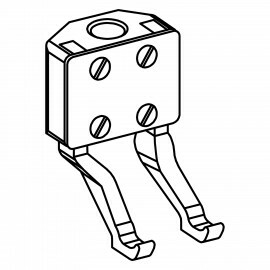 32mm width (removable).Adjusting both presser feet bases height and pressure independently.Sewing different thickness fabrics simultaneously.Suitable for Machine:Pfaff 938.. Tape Attaching Right Compensating Feet for Zigzag (Adustable)For tape/elastic attaching, max. 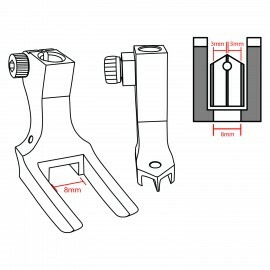 32mm width (removable).Adjusting both presser feet bases height and pressure independently.Sewing different thickness fabrics simultaneously.Suitable for Machine:Pfaff 938..
Roller Zigzag Feet with GuidingMax. Elastic Tape Size : 20mmNeedle Hole Width : 11mmPresser Feet Width : 16.5mm.. Tape Attaching Foot with GrooveUnder-tape Size AdjustableMax. 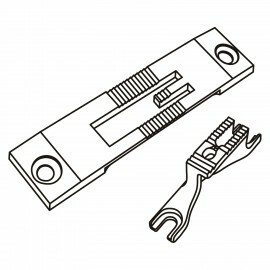 Elastic Tape Size : 17mmPresser Foot Width : 21mm.. Tape attaching foot with a longer groove that extend to end of foot.Under-tape Size Adjustable.Max. 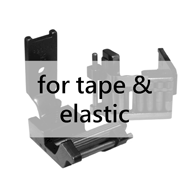 Elastic Tape Size : 15mmPresser Foot Width : 21mm.. Guiding FootElastic Tape Size : 7 ~ 21mmNeedle Hole Width : 8mmTotal Foot Width : 16.4mmPressing Width : 11.5mm..
Pfaff Zigzag Tape Attaching FootTape SizeNeedle Hole WidthPresser Foot Width5 mm5 mm12 mm6 mm6 mm13 mm8 mm8 mm15 mm10 mm10 mm17mm..
KP438-770 is a tape attaching foot with a downturn tape folder and guiding groove under it.Tape Size : 5/8"Finished Size: 5/16"Groove Size : 5/16"Needle Hole Width : 10mmTotal Foot Width : 16mm..
KP438-770K is foot for tape attaching on open seam. A downturn tape folder with center guide is mounted at the front. A groove is under it for tape guiding. Tape Size : 5/8" Finished Size: 5/16" Groove Size : 5/16" Needle Hole Size : 10mm Total Foot Width : 16mm ..
A big roller tape guide is fixed in front of the foot.Roller tape guide enable the sticky material such as elastic rubber tape move smoothly.Guiding width is is adjustable, max to 37mm.The guide position is adjustable.Max. Tape Size : 37mmNeedle Hole Size : 11mmTotal Foot Width : 22mm..
Pfaff Zigzag Tape Attaching Feet with Dual Compensating GuideTape SizeNeedle Hole WidthPresser Foot Width8 mm6 mm16 mm10 mm8 mm18 mm12 mm10 mm20 mm..